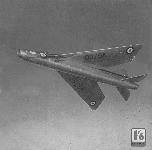 В 1963 году образовавшаяся "British Aircraft Corporation" занялась дальнейшей модернизацией перехватчика English Electric Lightning, принятого на вооружение в 1960 году. Его появление возвестило начало новой эры ДальшеMore>>> для британских ВВС. Инициатором этого проекта стал В. И. В. "Тэдди" Питтер. Благодаря его дальновидному предложению фирма "English Electric" получила в еще 1947 году контракт на постройку экспериментального сверхзвукового самолета P.1A. Этот самолет с двумя бесфорсажными турбореактивными двигателями Bristol Siddeley Sapphire впервые взлетел 4 августа 1954 года, а в дальнейшем в одном из полетов превысил скорость звука. Были собраны три экземпляра: два для летных испытаний и один для наземных испытаний на прочность. Эти самолеты отличались характерными эллиптическими воздухозаборниками. The English Electric P.1 will not land at Farnborough owing to Security restrictions. It will fly over on the two public days. 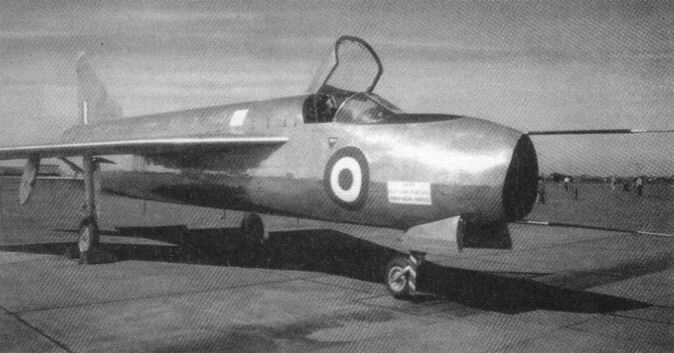 Second prototype English Electric P.1. 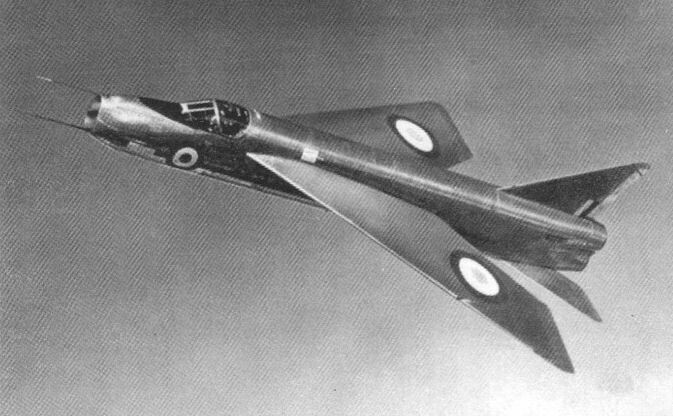 The English Electric P.IA, WG 760, progenitor of the Lightning, perhaps the one really outstanding British fighter of the thirty years following World War II. 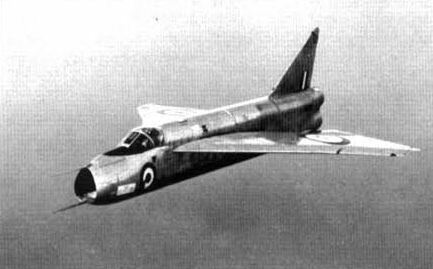 First flown on 4 August 1954, with 'Bea' Beamont at the controls, the twin 8.100lb s.t. unreheated Armstrong Siddeley Sapphire AS8a5-powered P.IA became the first British aircraft to exceed Mach 1 when it reached Mach 1.02 at 30.000 feet, or 692mph on 11 August just six days into flight testing. 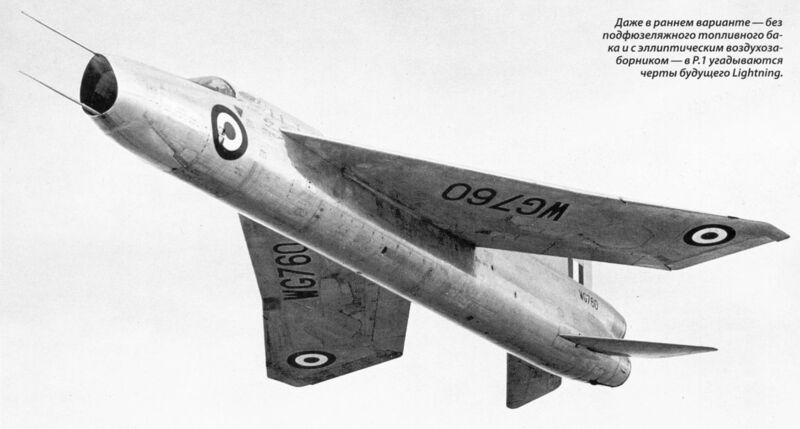 The English Electric P.1 single-seat interceptor is powered by two Armstrong Siddeley Sapphires which will probably have afterburning when the P.1 goes into service. It flies faster than sound in level flight without afterburning or any other form of power boosting . This fine action study taken at this year's S.B.A.C. Display by the Shell Film Unit reveals the planform of the Sapphire-powered English Electric P.1. This is the second prototype - WG760 was the first - and is one of five which precede the pre-production order for twenty of these supersonic, single-seat interceptors. The P.1A (WG760) is conducting flight trials with a revised wing shape. This photograph shows that extra area has been added to the wingtips. P.1A WG 760 is shown with the cranked-wing leading edge and inset ailerons which possibly will be incorporated in production machines. 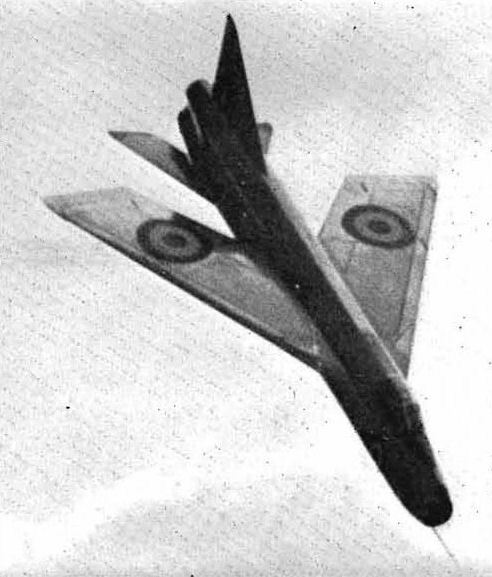 Other P.1 features shown below are the gunports and ventral bulge on WG 763, and the drooped leading-edge flaps (photo). Other P.1 features shown below are the gunports and ventral bulge on WG 763 (photo), and the drooped leading-edge flaps. 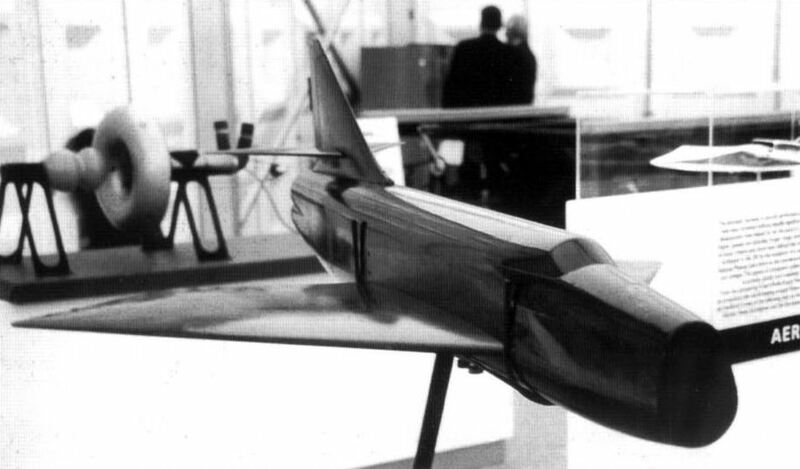 This 1949 wind tunnel model of what was to become the English Electric P. IA of 1954 provides an insight into the vital part the wind tunnel plays in the transition from drawing board to flyable prototype. 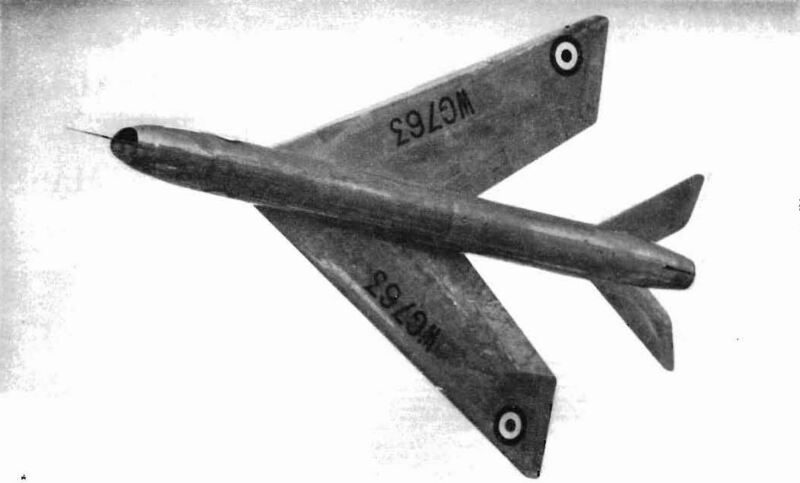 While recognisable as a precursor of the RAF's Mach 2 Lightning, the tail unit configuration, along with the low mounted wings, caused severe pitch-up forces at transonic speeds. An item of possible interest to trainspotters is the uncanny resemblance of this model's windscreen to that of the Deltic locomotive built for British Rail by another English Electric Division.